The Olympic Development Program (ODP) is part of the original Olympic Development Program founded in 1977 by US Youth Soccer as a national identification and development program for elite level players. The program identifies and develops players to compete at the state, regional, and national levels in support of National Team development efforts. The function of ODP is the identification, selection, and opportunity for development of the state’s top players, and through high level training and competition, to provide the means by which these players are prepared to compete for selection for regional, national, collegiate and professional opportunities. To identify national team players early, at the youth level. To provide development opportunities for these potential national team players. RVYSA teams participate in Region III tryouts every Fall. The specific dates of the Region III tryout vary each year but are usually around October and are held in McAllen at the De Leon Soccer Complex, as well as at various other locations across the state of Texas. ODP Tryouts are for both boys and girls born between 2006 and 2000. What if I cannot attend the tryout dates but want to participate in ODP? If you can't attend the local tryout held every year in McAllen - no worries. There will be multiple other tryout locations and dates held throughout the state of Texas over the course of the Fall season. You can attend any one of these tryouts to be observed and evaluated by State ODP training staff. You may only attend one tryout. Can I register for ODP if I do not play for a registered RVYSA club or program? Short answer: Yes. However, you'll need to contact our RVYSA office and pay a player registration fee in order to be eligible to participate in the tryouts. What happens during ODP Tryouts? Players will be asked to arrive an hour to 30 minutes before the tryouts begin in order to check-in, receive instructions, and warm up. Players will receive a t-shirt and a numbered bib that must be worn during tryouts at all times. Players will then be sent to fields where their respective age group will be evaluated by the age group head coach and assistant coach, as well as other odp staff. The tryout schedule will be posted online one week prior to each tryout. What is Region III Camp? 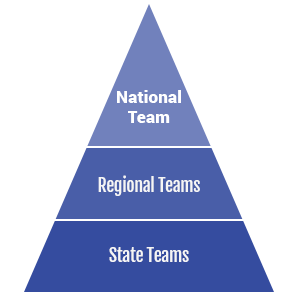 US Youth Soccer is divided into four Regions. All Regions offer a Regional Camp for ODP participants in each eligible age group. The camps are designed to develop elite players through high-level competition and training. During Region Camp training and competitions, players are observed and identified for possible selection to the official Region team. Region team players attend events that place them in contention to be selected for US Soccer Youth National Teams. The specifics, as well as the cost, of these Regional camps will be provided by RVYSA to all invited players.